The personal fabrication laboratory, or "fab lab", simply wouldn't be complete without a desktop 3D printer. Since September 2010, this specific little niche has been filled by MakerBot Industries' Thing-O-Matic, a CNC tool that turns computer designs into physical objects. But three Dutch makers at a lab in Utrecht are challenging the Thing-O-Matic's reign with their own plastic-printing desktop device: the Ultimaker. Siert Wijnia, Martijn Elserman, and Erik De Bruijn met at Fab Lab/Utrecht in Holland--Wijnia happened to be the manager of the MIT Media Lab-affiliated fabrication center. The three makers set out "to [make] a better 3D printer, not necessarily to start a business," says De Bruijn, but after the Ultimaker debuted at a December 2010 robotics conference, they decided to try their hands at running a business after all. The main difference between the Ultimaker and the Thing-O-Matic is which parts move: In the Thing-O-Matic, the print head is stationary while the build platform moves. On the other hand, the Ultimaker's platform remains still while the print head zooms around. The difference carries over into different aspects of the design, of course. The Thing-O-Matic's motors are mounted to moving parts, while the Ultimaker’s are mounted on the printer’s stationary frame; that frees up more build space (an 8.25-inch cube for Ultimaker, as opposed to the Thing-O-Matic’s 5-inch cube) and allows the build to progress more quickly. Exactly how much more quickly is up for debate, as you can see in MAKE's article comparing the two printers in terms of speed, software, and many other factors. 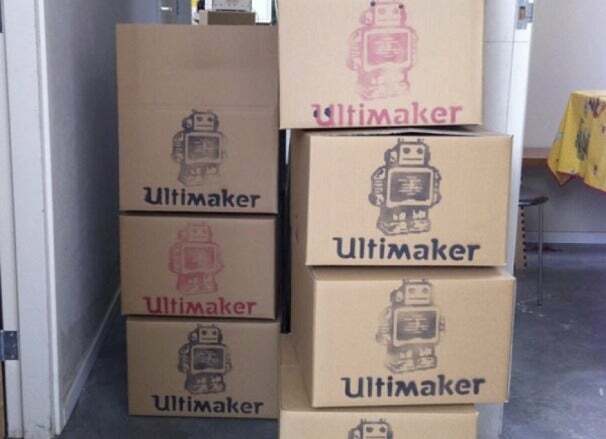 The US$1700 Ultimaker has already racked up more than 120 sales--paltry when compared to the 5000 Thing-O-Matics out in the world, but impressive considering the product's age. I wonder, as more 3D printers are introduced--like eMAKER's Huxley--if the maker community will divide along brand-loyalty lines. Is Ultimaker vs. MakerBot the new Mac vs. PC? Rachel Martin has a thing for cute robots and fab of all kinds. Find her at @RachelMGeek on Twitter.